Figure A35. Great Basin anomaly, interpreted as the Great Basin slab, with (horizontal) [vertical] cross sections through (A)[D] the UUP07 p-wave) and (B)[D] the combined SL2013 and S40RTS s-wave models at 510 km; C) the location of the modern geological record that we interpret to have formed during the subduction of the slab. A positive wave speed anomaly has been imaged below the Great Basin, Nevada (Figure A35), and was originally named the Nevada Cylinder (Roth et al., 2008). 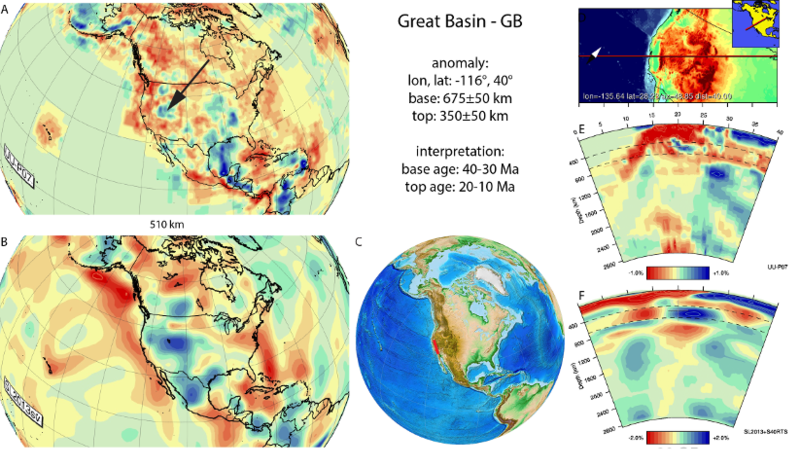 The Great Basin anomaly is located in the upper mantle below southwestern North America, and has been imaged at depths of~100-800km (West et al., 2009). It has an overall N-S trend and dips to the NE. It has been interpreted as either a lithospheric drip due to gravitational instability (West et al., 2009), a relic of the Laramide flat slab (Schmandt and Humphreys, 2011), perhaps fragmented by fracture zones (Sigloch, 2011), or a putative mantle plume (Obrebski et al., 2010). Based on its elongation and dip, we interpret the anomaly to be result of Cenozoic subduction, and follow the interpretation of Liu and Stegman (2011) considering it represents subducted Farallon oceanic lithosphere. Based on mantle convection modelling, they argued that its subduction initiated at ~35 Ma, and ended with slab detachment at ~15 Ma. Its subduction may correspond to phase of ignimbritic volcanism in the Great Basin between 31-20 Ma (Best, 1991; Dickinson, 2006).